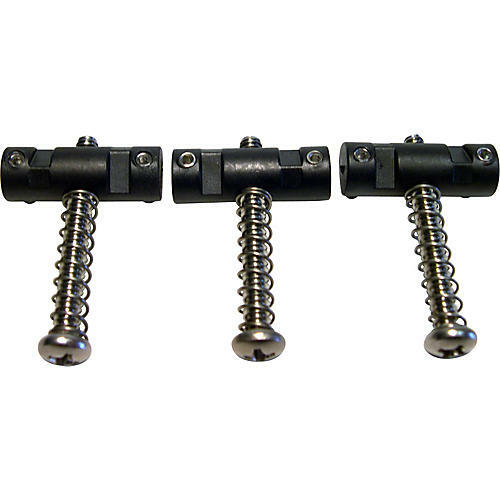 The 3-piece Compensated String Saver IOS Saddles (PS-8163-00) are superior replacement saddles for Fender Telecaster electric guitars. The String Saver guitar saddle is made with a unique combination of materials made to enhance tone and dramatically reduce string breakage. How does the Graph Tech String Saver Saddle work? A string rests on a metal saddle that binds and locks the string in place. As the string vibrates, it is stressed on a very specific point producing metal fatigue and then string breakage. Each String Saver guitar saddle is impregnated with Teflon, the slipperiest substance on earth. The Teflon in the String Savers guitar saddle eases the grip between the saddle and string, spreading the stress over a greater portion of the string, just enough to drastically reduce string breakage. Teflon is 500% more slippery than graphite and is impregnated throughout the Graph Tech String Saver material, so its lubricating properties will never wear out. Use the String Saver guitar saddle and get strings that last and last, no matter how hard you play…Graph Tech guarantees it! Metal saddles have a pronounced 2 KHz treble spike that dominates the tonal spectrum. The String Saver guitar saddle has a more balanced tone, with highs, mids and big open lows. You will also notice this Graph Tech saddles provides an increase in sustain by up to 25% over brass saddles and 15% over steel.